Oh Katie! We're so happy to hear this because we were getting so worried about the shoddy treatment you've been getting lately since Glogirly started this whole job thing. That evil thing gets around! It lives here too! Yay! Congratulations to both of you!! Great News! Cool! What would be even better is if she got a job that never required her to leave the house! Then she could be your servant all the time! We love your Salmon Dance. Oh boy!!! We're SUPER excited and we don't even know why!! Mom says GG should send her an email and tell her all about it! We hope there is a ton of extra money that comes with it! Woo hoo! 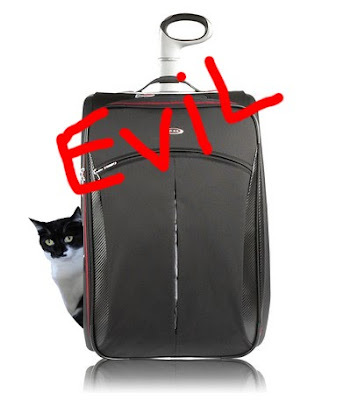 We think jobs that involve evil suitcases should be banned. We're doing a salmon dance with you! This is great news! 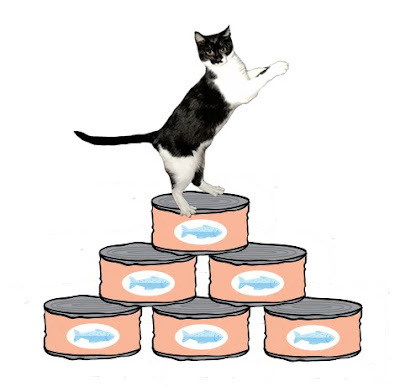 I will salmon dance with you. I have only seen the evil suitcase once and that was one time too many. Congratulations to Glogirly! Please come to my Gotcha Day party starting now. Yeaa!! We sure hope your girl will get to stay home a lot more. Katie, we're so happy for you! Less of that evil suitcase is always good. She must have done a lot of traveling with the CC job! A new job closer to home is better because then you can post and visit your kitty friends more! That's grrrr-8! 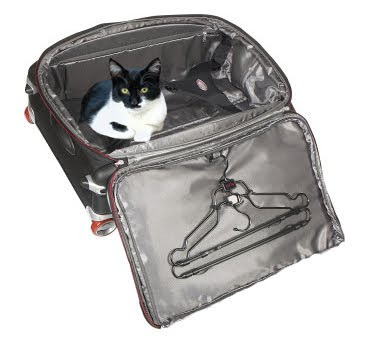 I don't like those suitcases either. It never indicates anything good!